"She came to Paris to forget about men, but the city of love has different plans for her..."
This line in the blurb had me so intrigued and add the lovely cover to it, I knew I had to read this book! Elise has her future finally planned and it definitely doesn't include tutoring the rude Frenchman, Paul who works in the cafe below her apartment. But fate works in mysterious ways and soon these two find themselves facing emotions that can well be called love! This is a story that is sweet, breezy and feel good yet predictable. You may feel like you know what is going to happen and will be proven right many times but still the story entertains and I loved reading it. Sometimes, one needs a proven, predictable romance to uplift ones mood and this book did just that with me. The author's writing style is engaging and she brought the lovely Paris to me right here in my home. Her descriptions are vivid and her characters, prople I could relate to. I loved watching Elise and Paul stumble and try to make sense of their feelings which was sweet, sometimes intense but always entertaining. 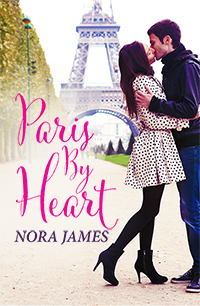 All in all, Paris By Heart by Nora James is a cute, breezy romance perfect for a lazy afternoon. 4 out of 5 to it from me and recommended to all romance lovers.